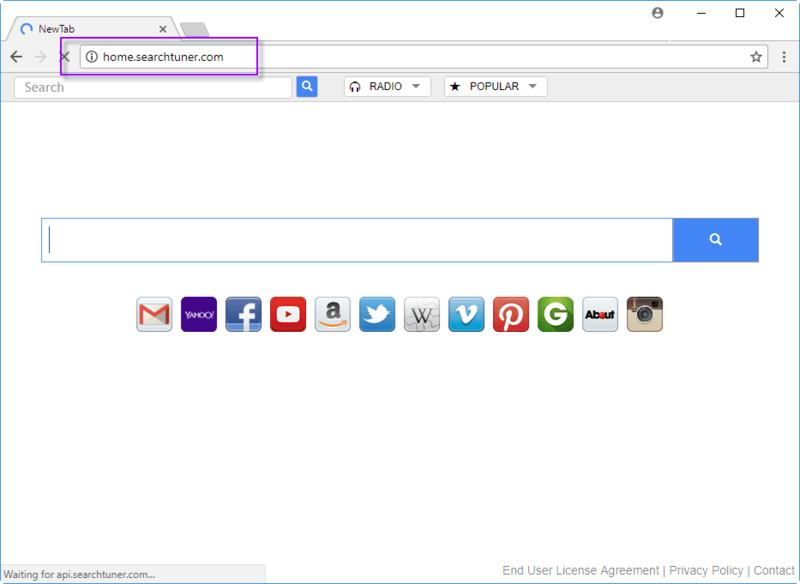 How to Remove Home.searchtuner.com from Internet Explorer, Google Chrome, Mozilla Firefox. We share with you an effective instructions for the permanent removal of Home.searchtuner.com infection are hard to find on the internet. Therefore, we have prepared this removal guide which describes in easy steps the most effective ways to permanently remove home.searchtuner.com infection from your computer. Home.searchtuner.com is a browser hijacker. Once this infection gets installed on your computer it captures the control of your browser settings. After this it changes the default search page and homepage of your browsers to http://search.searchtuner.com and http://home.searchtuner.com. It is impossible to revert these changes unless you delete Home.searchtuner.com infection from your computer by using our removal methods. How Home.searchtuner.com comes into computer? This hijacker uses Bundling method to hide itself in other free programs. Therefore, when you install such bundled freeware this infection is able to enter your computer without your knowledge. Afterwards you find your search queries are being redirected to Yahoo Search. Also, most of your search results are generated only to earn advertising revenue. In such a condition, we would suggest you to use our removal techniques and you will be able to uninstall Home.searchtuner.com infection from your computer. 1. ‘New Tab’ functionality of your browsers is opening an unwanted search page. 2. All your search results are bogus and from a malicious website. 3. Conventional removal methods have failed to get rid of Home.searchtuner.com infection. How we can prevent from Home.searchtuner.com infection? Following precautionary measures should be taken to protect your computer from such infections. Never install freeware without proper verification of its security ratings. Stop installation of extra apps while installing a software by choosing Custom or Advanced installation mode. Periodically check your computer using an antivirus and an anti-malware program. How Remove Home.searchtuner.com Search Bar? Here, we will provide instructions on how to remove Home.searchtuner.com from your computer. Our guide describes manual and software removal techniques of this hijacker. Carefully, perform all the steps of your preferred method in correct order to eliminate this infection from your computer. Basic steps to Remove home.searchtuner.com. Step 1 : Uninstall home.searchtuner.com malicious programs from your computer (Manual Step). Step 2 : Remove home.searchtuner.com browser hijacker from “Internet Explorer, Firefox and Chrome” (Manual Step). Step 3 : Remove home.searchtuner.com virus from “Windows Shortcuts” (Manual Step). Step 4 : Remove home.searchtuner.com malicious program from “Registry” (Manual Step). Step 5 : Remove home.searchtuner.com suspicious from “Computer Start-up” (Manual Step). Step 6 : Remove home.searchtuner.com adware using “AdwCleaner” (Free). Step 7 : Remove home.searchtuner.com Browser hijacker using “Junkware Removal Tool” (Free). Step 8 : Remove home.searchtuner.com virus using “Hitman-Pro” Anti-Malware (Free). Step 9 : Remove home.searchtuner.com Infection using “Malwarebytes” Anti-Malware (Free). STEP 1 : Uninstall home.searchtuner.com malicious program from your computer (Manually). Uninstall home.searchtuner.com browser hijacker from control panel, which you have accidentally got installed recently, Uninstall recently installed programs. follow below instructions to uninstall it from control panel. STEP 2 : Remove home.searchtuner.com browser hijacker from Internet Explorer, Firefox and Google Chrome (Manually). Remove home.searchtuner.com homepage from Internet Explorer. Remove home.searchtuner.com homepage from Mozilla Firefox. Remove home.searchtuner.com addons from Mozilla Firefox. You’ll get a window which have listed all installed addons, Remove / Disable home.searchtuner.com add-ons. Also remove all the unwanted add-ons from there. Select home.searchtuner.com extension and click on their recycle bin icon to remove it completely from Google chrome. Also remove all the unwanted extensions from there. STEP 3 : Remove home.searchtuner.com infection from “Windows Shortcuts” (Manually). Right click on the icon of Internet Explorer on desktop then select Properties option, you’ll get a small window, In that window, look on the target field, if you found “home.searchtuner.com” string in this target field, please remove all the string related to home.searchtuner.com. STEP 4 : Remove home.searchtuner.com malicious program from “Registry” (Manually). Type home.searchtuner.com into find box, and click on Find Next button. if it found any entry with the name of home.searchtuner.com in result, so please replace all them to Google, or you may remove them if you found suspicious. STEP 5 : Remove home.searchtuner.com suspicious entries from “Computer Start-up” (Manually). Click on Services Tab, and un-check all the home.searchtuner.com entries. Click on Startup Tab, and un-check all the home.searchtuner.com entries. STEP 6 : Remove home.searchtuner.com Adware registry entries using “AdwCleaner” (Free). After reboot you will be got rid of home.searchtuner.com from your computer. After reboot, you’ll get removed home.searchtuner.com from your computer completely. STEP 8 : Remove home.searchtuner.com virus using “Hitman-Pro” Anti-Malware (Free for 30days).